Artwork for Automatonera Anthology by Aurelien Fournier. It’s been a while since my last update on the Automatonera Anthology, so I’m bringing in something extra in the form of new art and a definite release date. 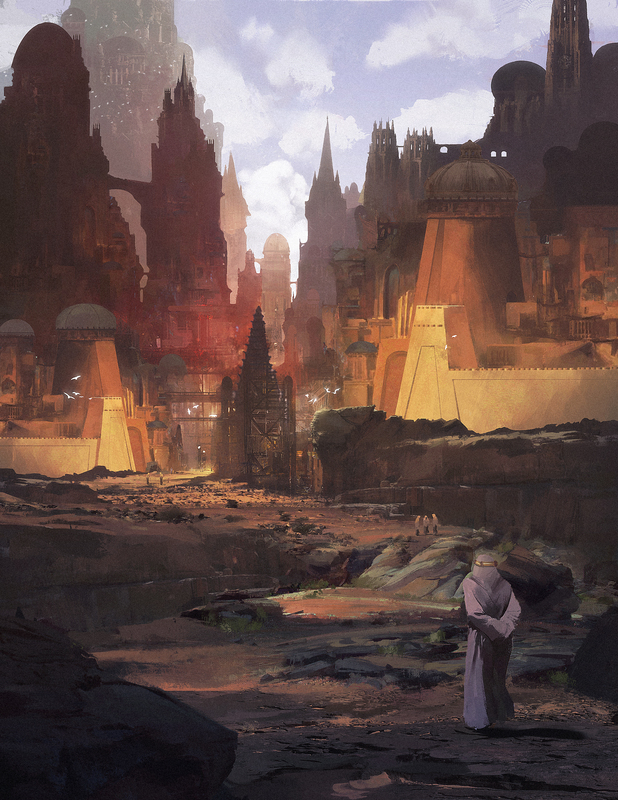 The latest piece of art is from French artist Aurelien Fournier who depicts the city of Dormanthalas in the desert lands of Flandanathem. The art piece is for the adventure tentatively titled “The Architect of Resurrections,” one of the adventures in the anthology. Without spoiling anything, it involves warring tribes who cease their hostilities after strange statues begin to appear throughout a northern mountain range in Flandanathem. Aurelien is one of many talented artists I’m working with to help visualize my ideas, and he’s doing a terrific job with it. He’s expected to produce more art for the adventure. You can find more of his work here. What I’m attempting to do is have different artists work on different adventures in the anthology to create a different feel and mood for each adventure. I’ll be previewing art as I get them and will give updates to the project at least once a month. The Automatonera Anthology, consisting of three short stories and three short adventures, will be published in PDF form in late Spring or Summer of 2016. I’ve been talking to a few people about publishing a hardcover edition, but nothing is set in stone. If I was to go down that path, I will announce as soon as I decide. Really good! Nice artworks !